Join us as we commemorate the 125th Anniversary of the Association of the Royal NSW Lancers with this special screening of the classic Australian war film. 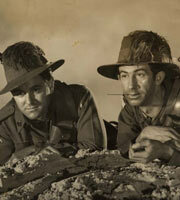 Starring Chips Rafferty (a long-term Parramatta resident and namesake of Riverside’s Raffertys Theatre), Charles Chauvel’s cinematic tribute to the mounted troops of the Australian Light Horse regiments is a rousing call to arms, giving life to the heroic tales of mateship during the Great War. A box-office smash on release, this is your unique opportunity to see this now rarely-screened film on the big screen.